Yesterday’s fieldwork observation dominated by snowshoe hare tracks in the fresh snowfall. This is a trail we have been working on over the past few weeks, and there are always hare tracks, but yesterday they seemed especially exuberant. Slow hopping, zooming, abrupt changes of direction. Tracks everywhere. I turn again and again to the Peterson Field Guide to Animal Tracks written and illustrated by the great 20th century American mammalogist Olaus J. Murie. 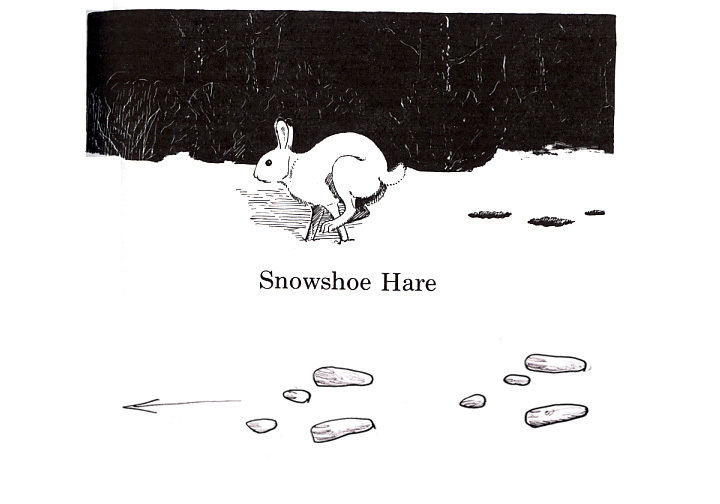 That’s his drawing of a snowshoe hare above, with my sketch of the track pattern below. I can lose myself in Murie’s wonderful pen and ink sketches and brief stories of animal behavior. It’s a book for sitting with, turning page after page. The term “mad as a March hare” goes back to at least the 1500s, and refers to the jumping, chasing, and boxing of European hares in springtime when breeding season comes upon them. I don’t know if that’s what the snowshoe hares are up to, but they are getting out and running around more. And who wouldn’t be, with the strengthening sun? I love your observations. Are you working for the USFS? I am, but prefer to not say much about my employer on this blog. I feel fortunate that the job allows me to spend a lot of time outside. By the way, your paintings are terrific!